Mixed Recycling: Your Recycling Container Isn't Just for Paper Anymore! Over the years, the separation of recycled materials has evolved. Do you remember when we first started recycling at home? We were required to separate each type of recycling in separate containers. The hauler would drive up to our house and pick these up, putting paper in one section of the truck, plastic in another, etc. Now we have single stream recycling. All recyclable material can be mixed together in the same container. Locally, Waste Management runs a single stream recycling facility under the name of Recycle America. Recycle America is a huge indoor facility where recycled material is separated and baled with like material. Watch OCRRA's video on recycling. 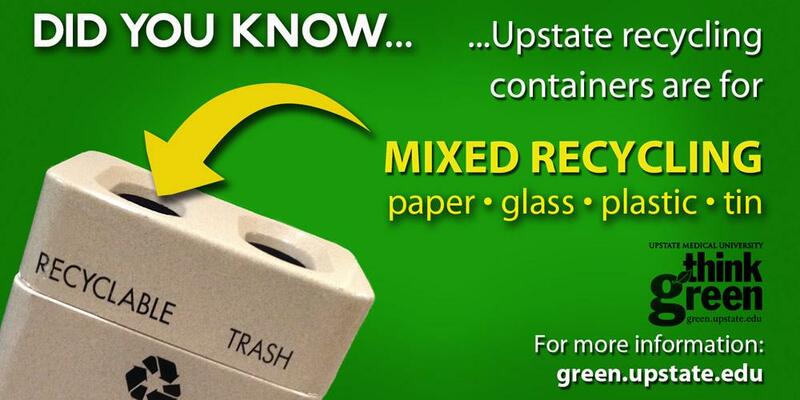 Many people still think that only paper can be recycled in the blue bins and other recycling vessels throughout our Upstate campus. This thought may inhibit a lot of recycling. Next time you have a can, plastic or other recyclable material, mix it in your blue bin at home, the recycling container under your desk, or the ‘dual stream’ receptacles around campus.